The rapid changes in technology are all around us and the latest financial technology developments feature in the news daily. But what does it mean to the family office? What developments should a family office be focusing on? The sheer speed of technology development coupled with the dramatic increase in technology adoption rates for family clients in other parts of their lives creates a sense of urgency for today’s family office. Family offices must act to remove outdated systems and processes in order to keep pace with modern business practices in office efficiency, service levels and execution. 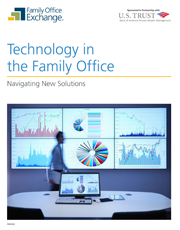 The 2015 FOX Technology in the Family Office white paper can act as your tool in determining what is right for your family office. This report is available only to family office members of FOX. This document is available to FOX Members only.